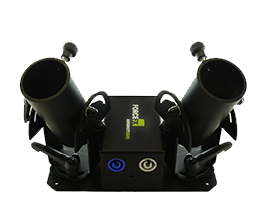 Another UK designed and built special effect the Airshot duo confetti cannon system is the newest addition to the ForceFX catalogue of effect hardware. Designed by our event technicians to suit their needs this system is designed for smaller venues and hire kits in mind creating quicker and neater rigging on site. The unique design of the Airshot allows 2 cannons to be fired simultaneously from one units in two directions. The unit can be rigged on stage using a base plate or in the truss. Multiple Airshot duo units can be chained together to fire multiple sets of cannons together. This effect is available to hire as a full 2 or 4+ head kit alongside as single units to add to your own system. Consumption & output - Electric Confetti Cannons 50cm: 5m - Electric Confetti Cannons 80cm: 12m - Electric Streamer Cannons 50cm: 10m - Electric Streamer Cannons 80cm: 20m!